This coffee cake has a few layers to enjoy. 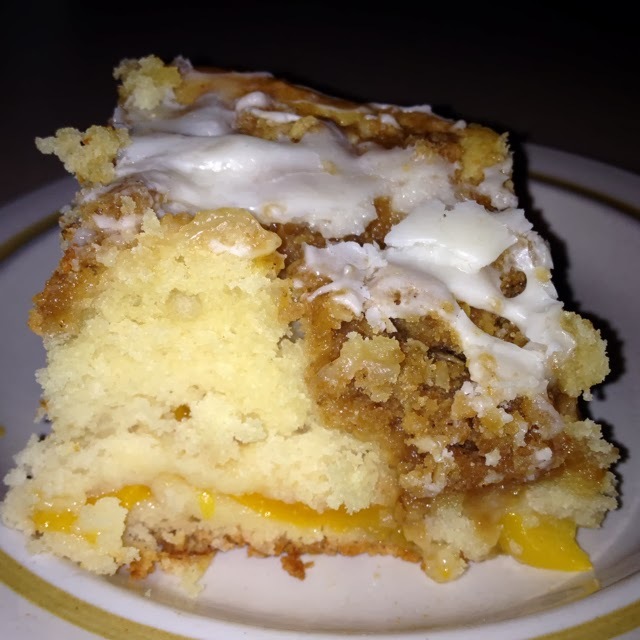 A base of coffee cake, a layer of peaches, more cake, then a streusel topping and a basic powdered sugar glaze tops it off. If you wanted to go over the top you could serve it with vanilla ice cream but I thought it was just perfect as is. Enjoy! 1. In a large bowl, cream butter and sugar until light and fluffy. Add eggs, one at a time, beating well after each addition. Beat in vanilla. Combine flour, baking powder, baking soda and salt; add to creamed mixture alternately with sour cream. Beat just until combined. 2. Pour half of the batter into a greased 13-in. x 9-in. baking dish. Combine pie filling and peaches; spread over batter. Drop remaining batter by tablespoonfuls over filling. 3. For topping, combine the brown sugar, flour, oats and cinnamon in a bowl. Cut in butter until mixture is crumbly. Sprinkle over batter. 4. Bake at 350° for 70-75 minutes or until a toothpick inserted near the center comes out clean. Cool on a wire rack. In a small bowl, combine confectioners' sugar and enough milk to achieve desired consistency; drizzle over coffee cake.